Convenient storage for a variety of art and hobby supplies. 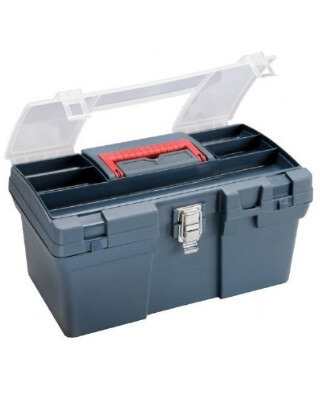 Made of durable plastic, featuring a divided compartment in the top with translucent lid that snaps closed. Red carry handle folds flat. 14" x 6¾" x 1¾" pull out tray reveals main compartment that measures 14" x 7" x 6½". Heavy-duty metal front clasp. Security slot can accommodate a small lock. Overall dimensions: 16" x 9½" x 8".